Croatian island of Hvar is the most famous tourist island in Croatia. It gained its reputation with a fact, that the island of Hvar has the most sunny days a year in the whole Europe. On this island, the sun shines an average of 2717 hours per year, which is a unique record. 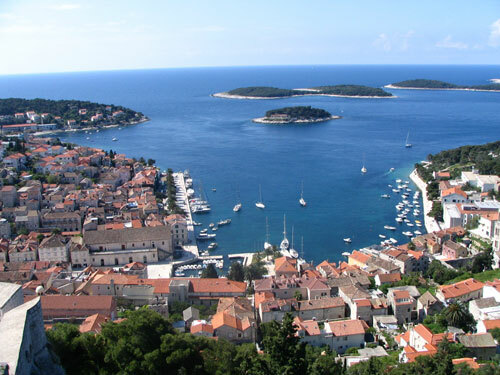 It is also named Suncani Hvar, Croatian for Sunny Hvar. Due to an excellent location and plenty of sunshine, the island is covered with vineyards, olive and lavender groves that grow perfectly. Hvar Island was inhabited very early. Historical remains of stone axes, needles and other stone tools, that were discovered in caves on the island, proves, that the island was inhabited in the early Neolithic. The first major settlement on the island was probably built by the Illyrians, who left behind the graves, temples and tools. Throughout history, the island of Hvar was developing, and people were in the vast majority engaged in fishing. They found out that the area at the end of Peljesac peninsula is rich with fish. Therefore, the citizens of south-eastern part of the island from settlements Bogomolja, Selca and Gdinj moved to the neighboring peninsula of Peljesac, and there set up a fishing village Loviste, whose inhabitants are fishermen today, as well as they are dealing with tourism. The main economic activity on the island of Hvar today is tourism. If you are looking for accommodation in this part of Dalmatia, then you’ll have no problem to find it, since there are a lot of private rooms, apartments, tourist camps and hotels, which differ with the offer and price. Because of the huge capacities, accommodation can also be found in the peak tourist season. Locals on the island of Hvar are very friendly and great cooks. You can be sure you’ll find excellent dishes in every of many restaurants all over the island. Great dishes will satisfy even the most demanding guests.